February | 2017 | Richard M. Hicks Consulting, Inc. 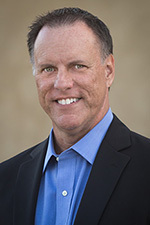 When troubleshooting DirectAccess client connectivity issues, you may encounter a scenario where clients are unable to connect using the IP-HTTPS IPv6 transition technology. Running ipconfig shows that the tunnel adapter IPHTTPSInterface media state is Media disconnected. Running the Get-NetIpHttpsState PowerShell command shows that the LastErrorCode is 0x2af9 (WSAHOST_NOT_FOUND) and the InterfaceStatus is Failed to connect to the IPHTTPS server; waiting to reconnect. The 0x2af9 error differs slightly from the more common 0x274c IP-HTTPS connection time out error (WSAETIMEDOUT). 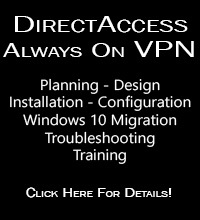 In this scenario the DirectAccess client can successfully resolve the DirectAccess public hostname to an IPv4 address, and if ICMP echo requests are allowed on the DirectAccess server’s public IPv4 address it will respond to ping. 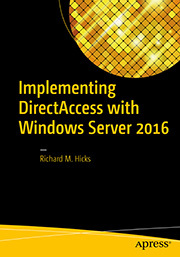 The DirectAccess client is also able to establish a TCP connection to the DirectAccess server using the Test-NetConnection PowerShell command. So, why is the IP-HTTPS interface unable to establish a transition tunnel connection when the DirectAccess server’s public hostname resolves correctly via DNS and the client can establish a TCP connection on port 443? Commonly this is caused by proxy server settings configured in the web browser on the DirectAccess client computer. 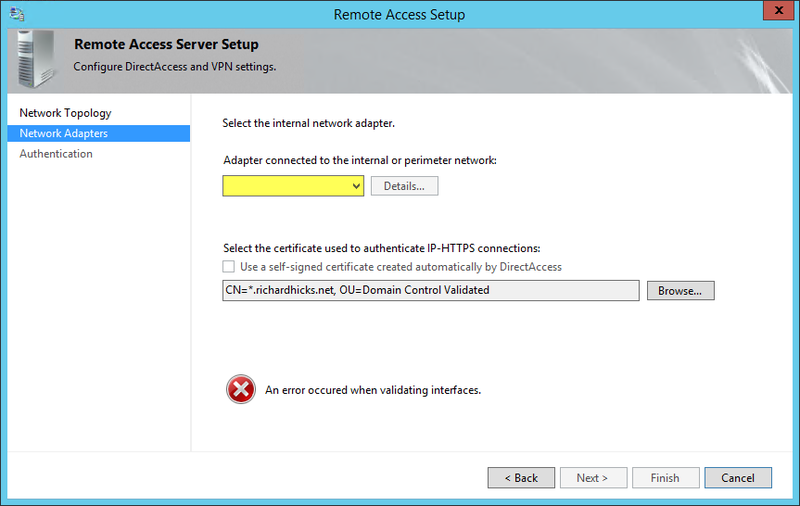 Disabling the proxy server in the client’s web browser should restore DirectAccess client connectivity over IP-HTTPS. 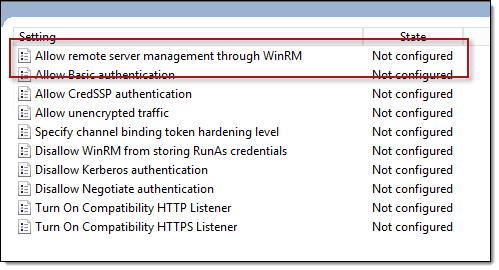 If clearing the proxy server settings in the client machine’s web browser still does not restore IP-HTTPS connectivity, it may be that a proxy server is also configured for winhttp. 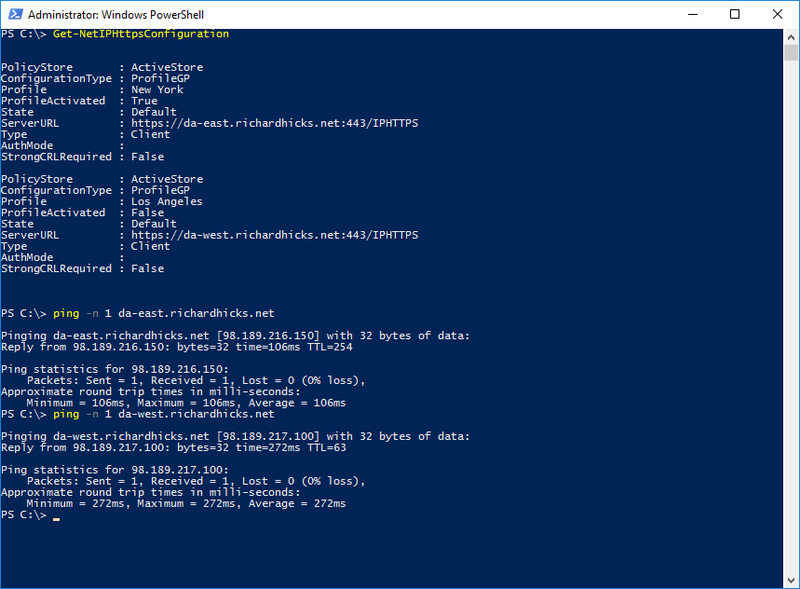 You can confirm this by opening an elevated PowerShell command window and running the netsh winhttp show proxy command. 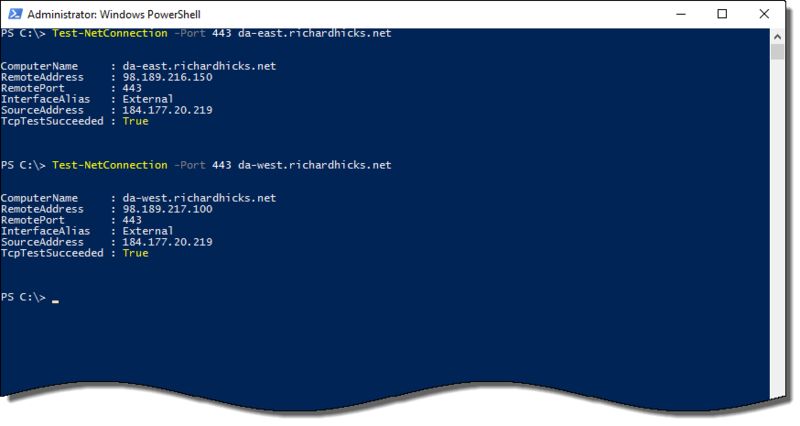 To clear the winhttp proxy server settings run the netsh winhttp reset proxy command.